Harry Sanabria is a social anthropologist whose research and teaching centers on economic anthropology and political economy, social history and historical demography, and cross-cultural studies of drug production and consumption. A Latin Americanist with primary interest in the Andean region, he has carried out field research on migration and coca production in Bolivia, drug use and dealing in inner city neighborhoods in New York City, and historical demography in Bolivia and Argentina. "Gender, Class, and the Political Economy of Reproductive Change in Puerto Rico" is a new project funded by the National Science Foundation (Harry Sanabria [Principal Investigator] and Gabriele Stürzenhofecker [Co-Principal Investigator]). The research will focus on the decline of fertility in Puerto Rico during the first four decades after the 1898 United States occupation. It will examine the driving forces behind this decline, and center analytic attention on the mutually reinforcing post-1898 transformations in the realm of work and labor, gender relations, and marital/domestic arrangements that gave rise to class-specific reproductive regimes. The struggle over coca in Bolivia represents the existence of a fundamental political, economic, social, and cultural cleavage between the Bolivian state and a significant segment of the militant coca producing peasantries. Sanabria, Harry The discourse and practice of repression and resistance in the Chapare. 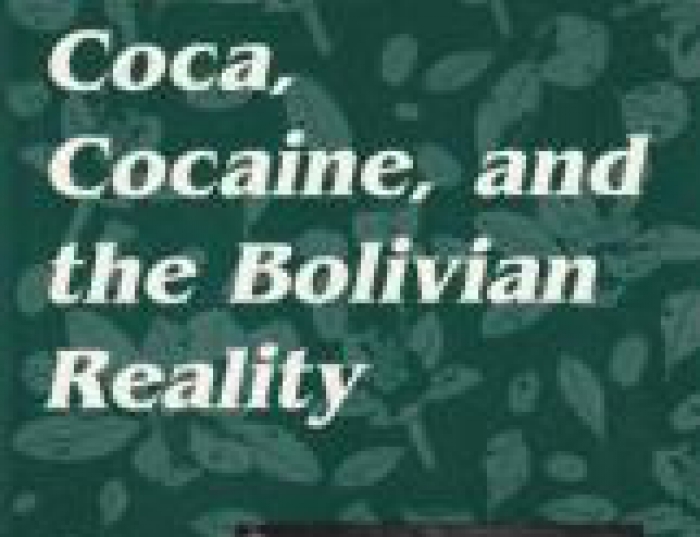 In "Coca, Cocaine, and the Bolivian Reality", edited by M. Barbara Leons and Harry Sanabria, The State University of New York Press, p. 169. By focusing on what baptismal entries in a Bolivian parish reveal about the transmission of surnames, I have suggested a significant shift in local constructions of and relationships between birth status and surname transmission as a direct response to the profound legal, political, economic and social transformations brought about by the Bolivian revolution and agrarian reform of 1952-1953. The purpose of this course is to offer a wide survey of the anthropology (including archaeology, history, and geography) of Latin America. It will emphasize changes of Latin America and Caribbean societies and cultures through time, and focus on key issues/themes that have consistently surfaced in Latin American cultural anthropology and continuing priority, relevance, and interest up to the present. Special attention is placed on historical, political, and economic contexts as a means of understanding contemporary cultural anthropological research in Latin America and Caribbean anthropology. This course is primarily tailored to students with little or no knowledge of, or experience in, Latin America and the Caribbean, will consist of lectures, readings, and films. Grades will be based on three non-cumulative, in-class exams, two written essays, and attendance. Undergraduate Seminar. This course reviews the development of economic anthropology as a special field of study, with particular emphasis on economic change and the impact of industrialization and capitalism on the Third World peoples. The thrust of this course will not be to simply cover data but to critically (albeit briefly) examine major themes/perspectives/debates of current concern in the field. This course will require a good deal of reading: undergraduate students can expect to read 75-100 pages a week: graduate students will probably read 150-175 pages weekly. All Students: This class will function as a seminar and it is therefore essential that readings be done regularly and on time, and that all students regularly participate in class discussions. Class attendance is mandatory. Sanabria, H. (2007) The Anthropology of Latin America and the Caribbean. Allyn & Bacon. Sanabria, H (2004) The state and the ongoing struggle over coca in Bolivia: legitimacy, hegemony, and exercise of power. In Dangerous Harvest: Drug Plants and the Transformation of Indigenous Landscapes edited by M.K. Steinberg, J.J. Hobbs, and K. Mathewson, pp 153-166, Oxford University Press. Sanabria, H. (2001) Bolivia. In Countries and Their Cultures. Vol. 1 edited by Melvin Ember and Carol R. Ember, pp. 245-258, Macmillan Reference USA.